This is one of my all time favorite tattoos! 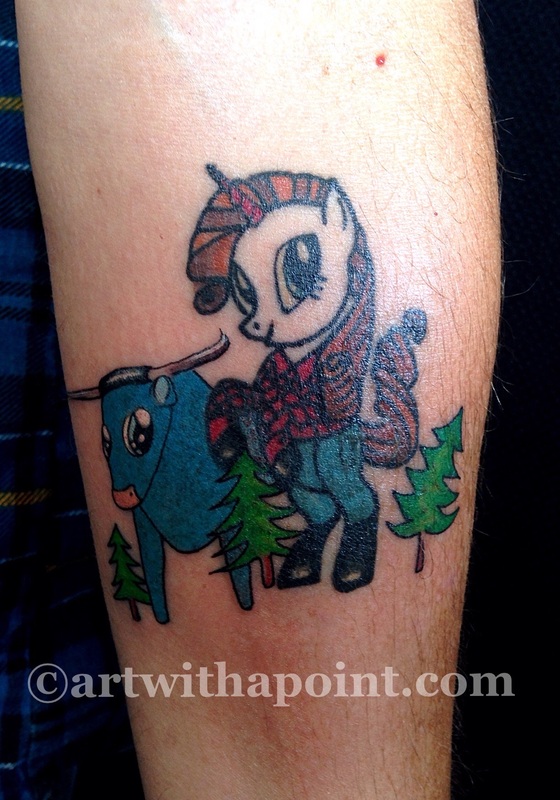 Pony Bunyan and Babe! There’s nothing more awesome than a whimsical sense of humor, and a tattoo concept customized to reflect the wearer. Pony Bunyan was originally done at the Safe Schools for ALL Youth fundraiser that I held. Several tattoo shops around the country did similar events. In this context, those of us sporting the MLP tattoos are doing so in solidarity with youth facing adversity based on who they are or what they like. https://www.artwithapoint.com/wp-content/uploads/2018/09/logo-and-type-v2.png 0 0 admin https://www.artwithapoint.com/wp-content/uploads/2018/09/logo-and-type-v2.png admin2014-10-10 16:09:262014-10-10 16:09:26Best. Tattoo. Ever.